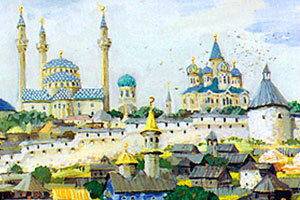 During the lifetime of Kazan the religious life of its inhabitants changed dramatically several times: from paganism to the total predominance of Islam, from forced conversion to Christianity to the principles of toleration. Each time it was a serious, sometimes painful shift in the social consciousness. And if we speak of today’s Kazan, for instance, it is an existing multi-religious centre, where the city mayor Kamil Iskhakov together with the legal adviser of the President of Tatarstan Rafael Khakimov try their best to make Vatican return the Icon of Kazan God’s Mother to the city. But since the middle of the ХVI-th century up to the end of the ХVIII-th toleration and collaboration of different faiths was out of question. The tsarist government tried to extirpate Islam in various ways: they expulsed the Moslem from the city, financially forced native-born population to change their faith, destroyed mosques and used force to achieve their aim. Nowadays in the city one can see side by side Orthodox Churches and Mosques, Catholic Churches, Churches of the Old Belief, even Krishna Temple and the unique Temple of all religions, which is being build by Ildar Khanov. According to experts judgements, in Kazan one can find much more respect towards different religious beliefs, customs and traditions than in other parts of Russian Federation.